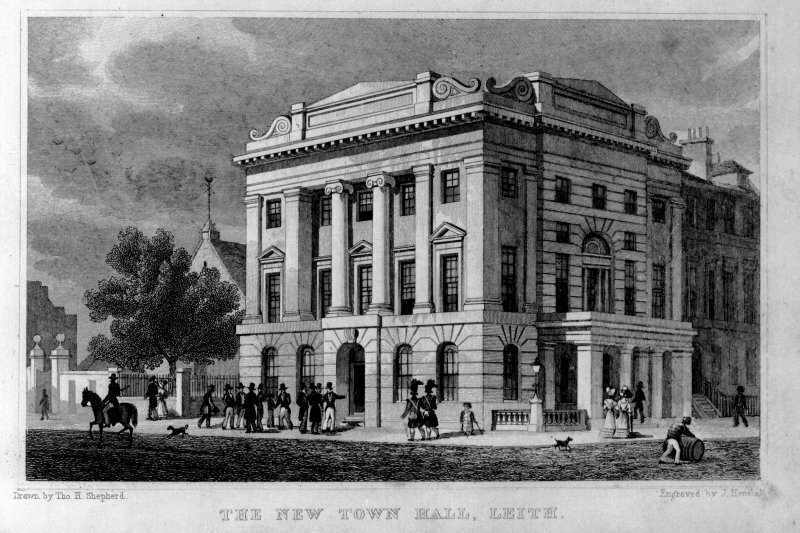 Photographic copy of an engraving showing general view of Leith Old Town Hall, insc: 'The New Town Hall, Leith'. 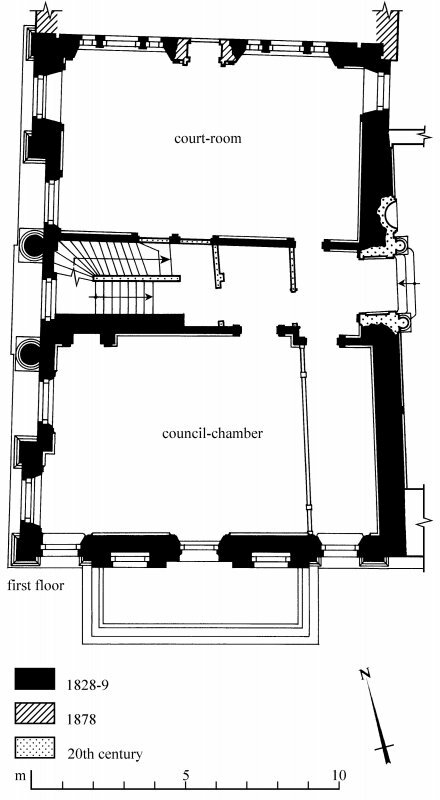 First Floor Plan Preparatory drawing for 'Tolbooths and Town-Houses', RCAHMS, 1996. 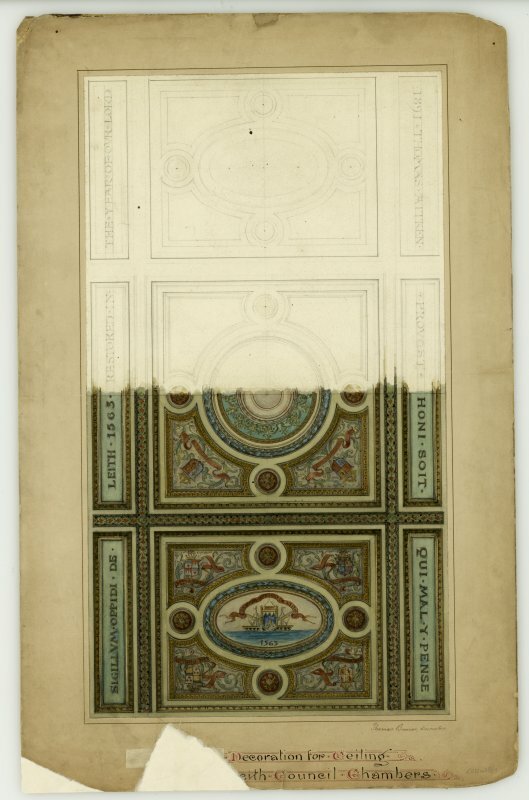 N.d.
R & R Dickson, 1828. 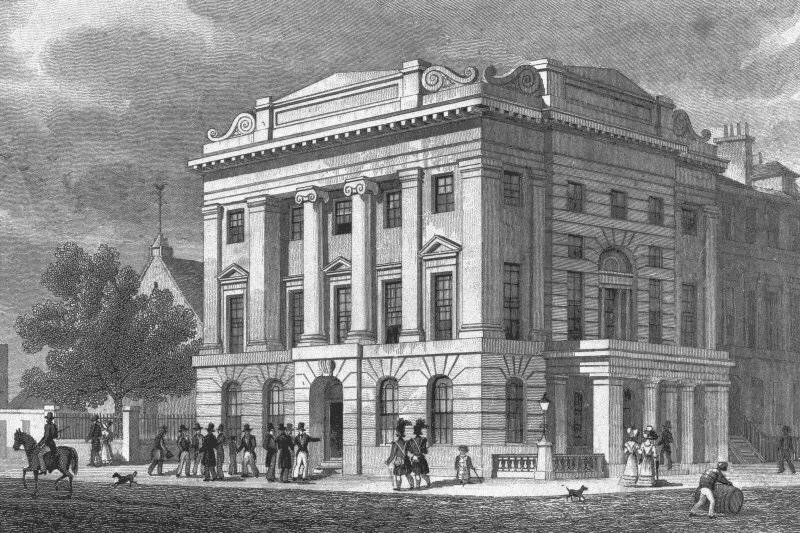 The town hall was designed by the Edinburgh architects R and R Dickson and built in 1828-9 at a cost of £3,260. 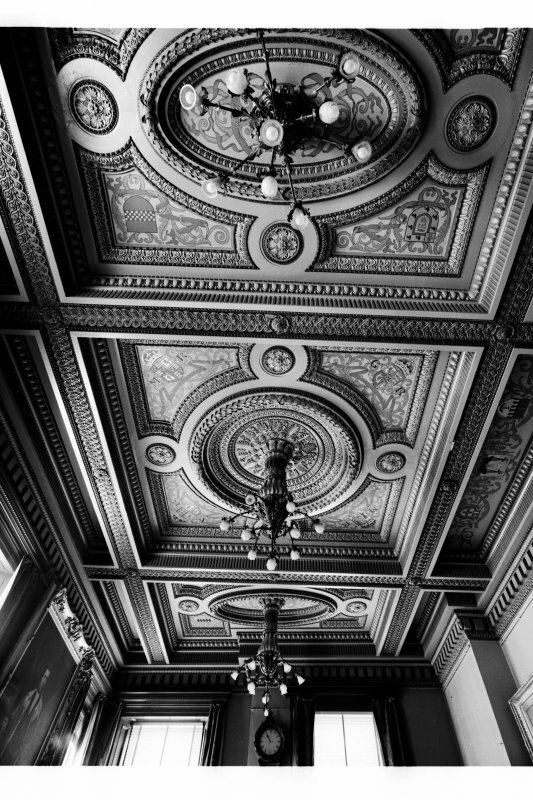 The adjoining, and slightly earlier, three-storeyed terrace in Queen Charlotte Street was converted to police and burgh offices by the local architect James Simpson in 1868 and refurbished by him, along with the original council-chamber, in 1891-2. Simpson also designed, in 1878, the two-storeyed classical prison-block that adjoins the N end of the original building and faces Constitution Street. 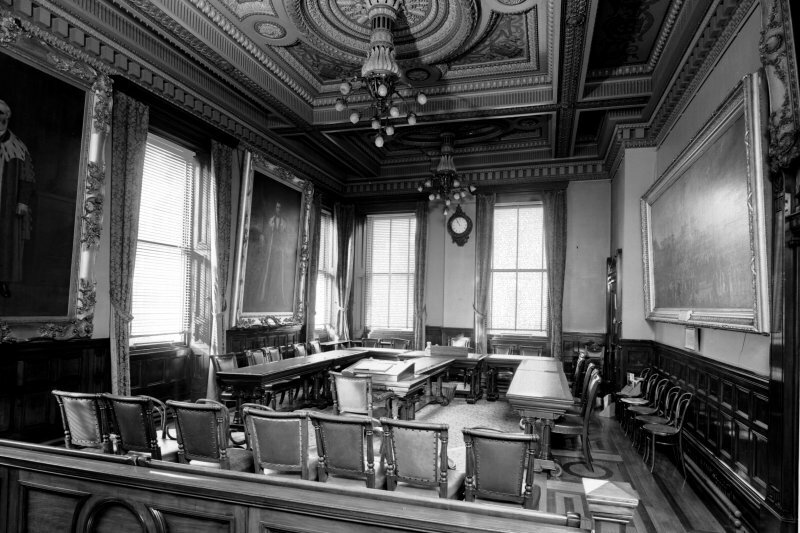 Further alterations were made in 1903 (including another extension to the E), in 1938 and in 1983, when inserted partitions in the former court-room were removed. The original block is three-storeyed and of slightly-splayed rectangular plan, the entrance (S) front measuring 13.5m and the W front 17.7m in length. The main facades are constructed of sandstone ashlar of excellent quality, specified as from ' the best Rock' of Craigleith Quarry. The masonry of the ground storeys is channelled, and the whole centrepiece of the S front is treated similarly, giving it a somewhat baroque character. This front has a three-bay portico with Tuscan columns in antis, flanked by segmental-headed windows, and at first-floor level there is a large tripartite window, with consoles set in the rebate of the central round-headed light. Flanking its arch-head, and above the side-lights, there are small square windows. The ground storey of the five-bay W front also has segmental-headed openings, the central one being a doorway giving access to the stair, while the central and the two outer windows at first-floor level are pedimented. The recessed central three bays of the two upper floors are divided by giant Ionic columns and framed by plain pilasters, which are repeated at the angles of the building. They carry a high entablature and a massive dentillated cornice. Both wall-heads have long pedimented tablets framed by giant scrolls. The W one is inscribed: ERECTED BY THE MAGISTRATES AND MASTERS / MDCCCXXVIII, and that to the S: TOWN HALL / R & R DICKSON ARCHITECTS. The interior has been much altered, particularly at ground-floor level, in connection with its present use as a police station, but the principal first-floor rooms are well preserved. 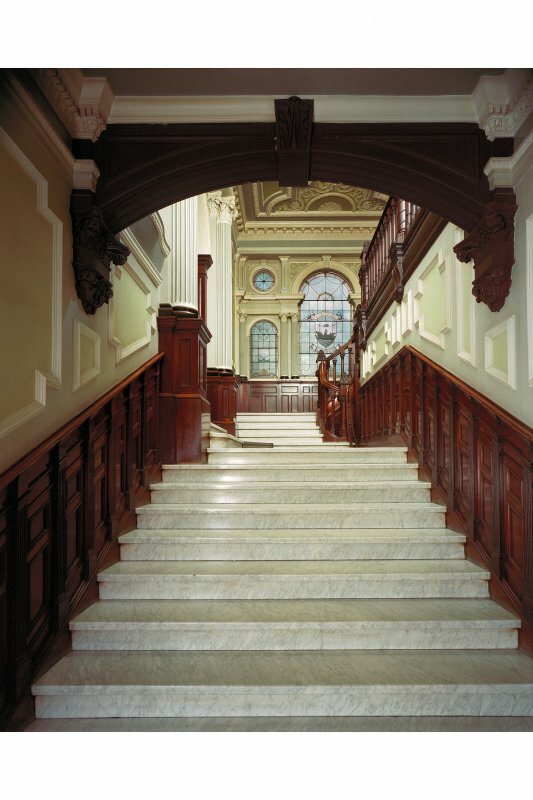 Set to either side of a central staircase, which was rebuilt in 1983 but occupies its original position, there are the sheriff court room, to the N, and the council-chamber to the S. The former has an anthem ion frieze with a dentillated cornice, and its panelled plaster ceiling has a central rose within a fret pattern. The windows are framed by tapered architraves surmounted by shallow pediments, and in the S wall there are blocked double doors which formerly provided separate access from the stair-landing and from an ante-room. 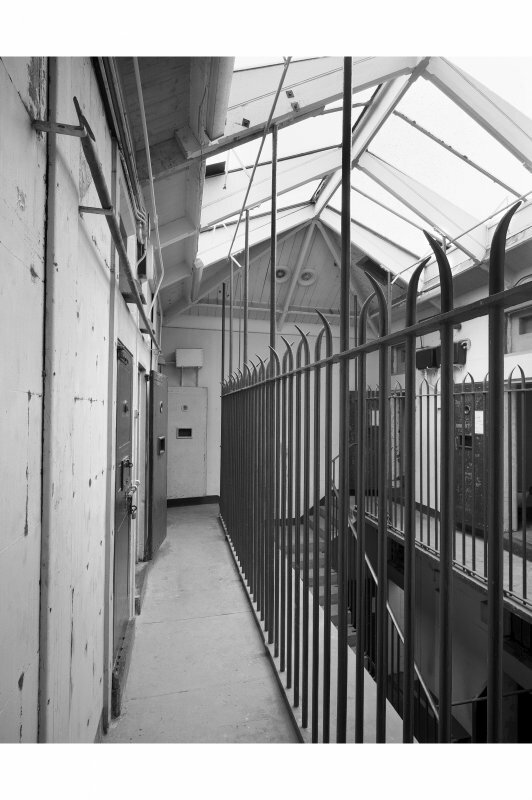 The magistrates' bench was set against the E wall, and in the N wall there is a doorway with a round-headed architrave, inserted in 1878 to give access to the adjacent prison-block. 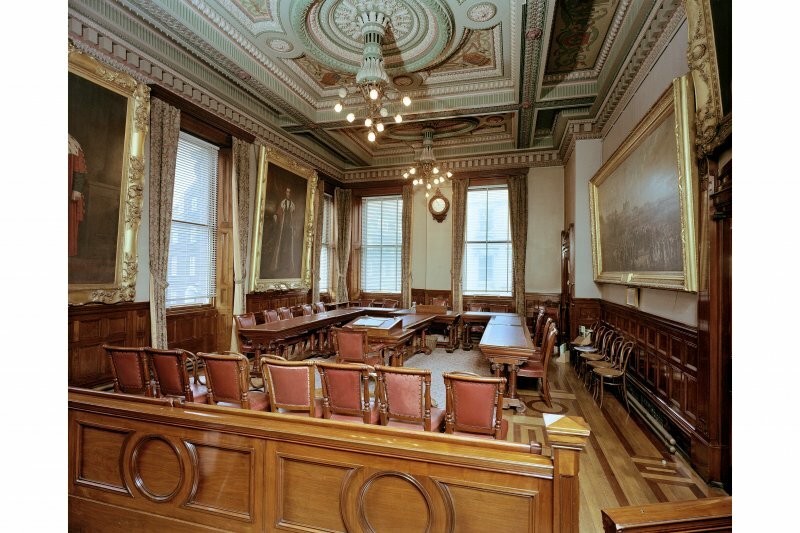 The council-chamber was enlarged in 1891-2 by the removal of inserted offices, and it is now entered from a richly decorated marble staircase of 1903 in the adjacent Regency block. 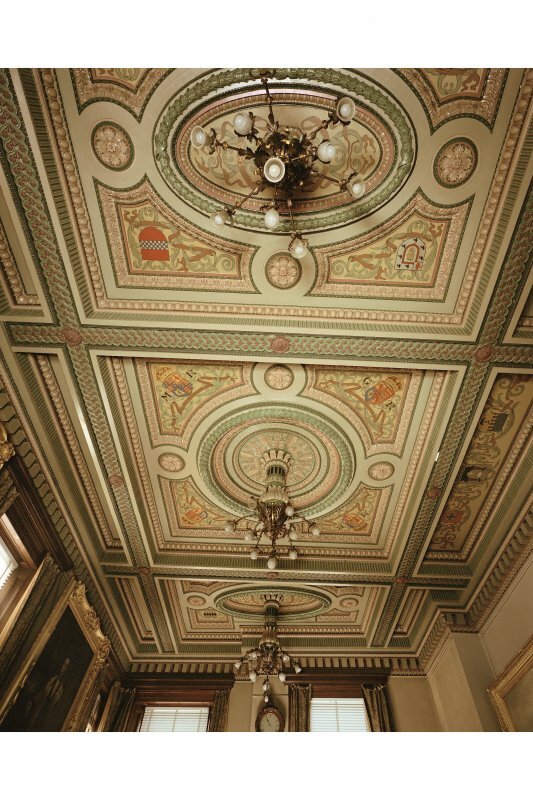 The principal decorative feature of the chamber itself is the ornate and brightly-painted plaster ceiling, decorated by Thomas Bonnar. 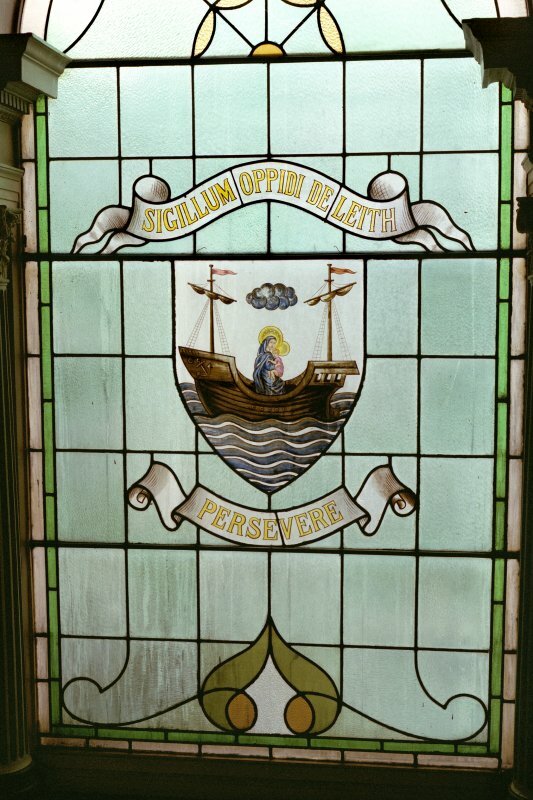 On the walls there hang portraits of local provosts and a large painting by Robert Carse of George IV's landing at Leith in 1822. 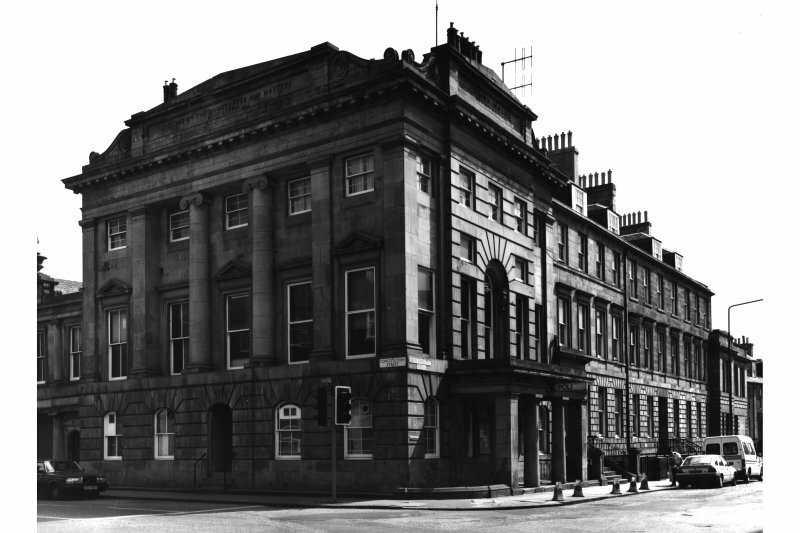 The town hall was built for the Magistrates (appointed by Edinburgh) and Masters (of the four local incorporations), a body which under the Leith Police Act of 1827 was given administrative powers and the duty to provide a sheriff-court and offices. The foundation-stone was laid in March 1828 and the completion of the town hall a year later was marked by the removal from the jail of the painting of George IV's landing. 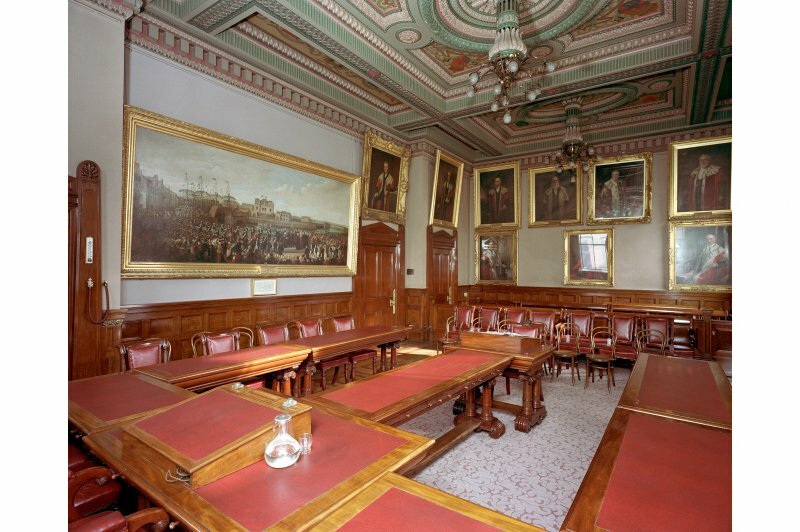 The main hall, which was to become the council-chamber, was used from the first for public meetings and ceremonies, and the Police Commissioners and the Magistrates and Masters themselves met there. 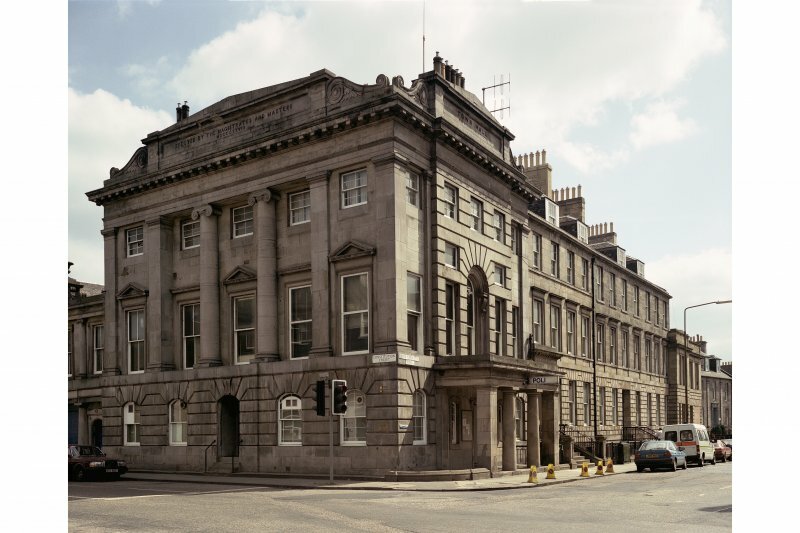 A town council was established when Leith became a parliamentary burgh in 1833, and it used the building from 1849 until 1920 when the burgh was amalgamated with Edinburgh. After many years in commercial occupation, the town hall was converted in 1983 for use as a police station.